Communication between individuals is the key to healthy relationships. 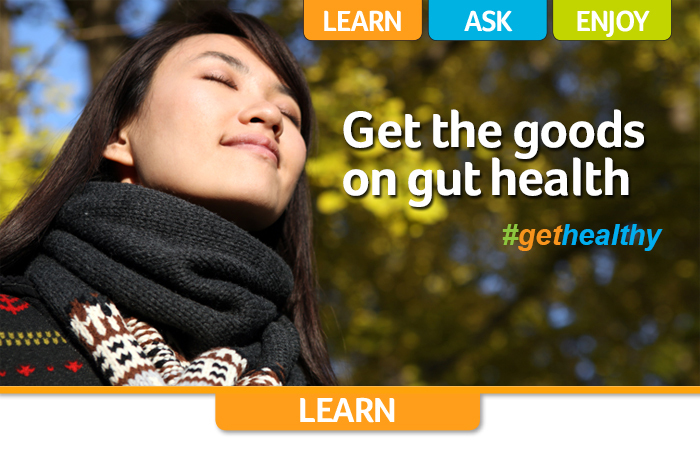 But, did you know that your good health relies on your gut and brain's chatty relationship? It's true! They communicate to support regulatory mechanisms to adapt to today’s modern lifestyles. Today’s fast-paced society, with a focus on process-filled food, is responsible for the loss of healthy, much-needed microbes that reside within us. Science is shedding light on the gut-brain axis; the implications of the bacteria in your gut and how your brain works, along with its impact on health. The gut houses a community of microorganisms (known as the microbiome) that reside inside the digestive tract and send out signalling molecules from their genes. These microbes are little factories that make chemicals from the food you consume for the body to use and in the process, prime your immune system. The gut microbiota is in part, responsible for many facets of health and disease. The gut-brain connection involves neural, endocrine and inflammatory mechanisms and when out of sync become a factor in many health problems we typically would not consider. This includes immunity, depression, anxiety, fatigue, allergies, asthma and possibly even neuro-generative brain disorders, such as Parkinson’s disease. Studies reveal that “missing” microbes (lowered diversity) in the gut may be driving obesity, Multiple Sclerosis, diabetes, inflammatory bowel disease and arterial stiffness. of the microbiome are related to health outcomes and wellness. You have heard the expression you are what you eat, but even more importantly, you are what your microbes eat. The last two decades of research have highlighted the fact that diet and nutrients actively shape the gut microbiota composition. The primary driver of the intestinal environment is the food that is consumed, and diet is the most powerful predictor of the gut microbiome. Essential requirements for a healthy gut include prebiotics, probiotics, fermented foods, fatty acids and polyphenols. Choosing products that have been designed based on this emerging science will be vital to advance your gut health, improve its communication with the brain, and benefit overall health. 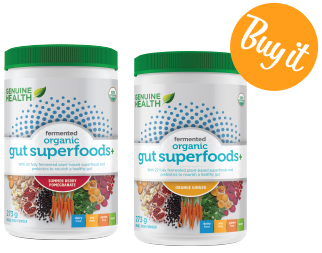 Genuine Health Fermented Organic Gut Superfoods+ is a new and unique innovation in gut health and is the only prebiotic superfood. It contains 21 organic, fermented superfoods. Fermentation ensures peak phytonutrient potency, which encourages the growth of beneficial gut bacteria, improving digestion and mineral absorption. It contains polyphenols, which according to research, provide exceptional benefits to the gut and its ecology – without the gas and bloating that other prebiotic formulations may produce. Genuine Health Advanced Gut Health Probiotics are multi-strain, triple purified, shelf-stable probiotics created with one goal: to seed your gut with stronger and healthier bacteria with carefully chosen strains to mimic a healthy gut microbiome. Vegan delayed-release capsules deliver up to 10X the bacteria to your gut for maximum effectiveness. 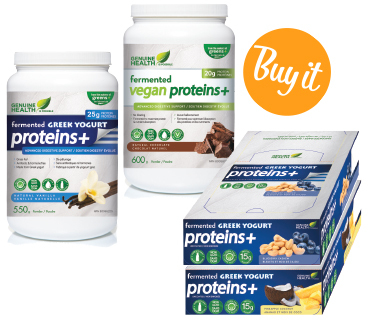 Genuine Health Fermented Proteins are highly absorbable fully-fermented plant-based and Greek yogurt proteins with gut health benefits. This forward- thinking formula contains bioactive nutrients that nourish the gut lining, strengthen digestive health and help it become more efficient at absorbing nutrients. It is a balance that makes life flow and little things make a big difference when it comes to optimal communication. Creating an environment in the gut that allows your microbes to flourish is becoming more and more necessary to mitigate a plethora of diseases. 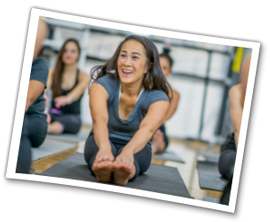 Genuine Health is on the leading edge of this new gut-brain axis research and knows that making a few well-chosen, yet powerful changes to your diet can offer a dose of prevention or for some, an ounce of cure. Obesity and insulin resistance can increase the risk of non-alcoholic fatty liver (NAFL), as can consuming 10 or more alcohol drinks per week, certain medications (estrogens, corticosteroids, methotrexate) and overnutrition, a starvation diet and rapid weight loss. Supplements to support NAFL include ingredients that target the liver. These include milk thistle, curcumin, dandelion, licorice and green tea. Alpha lipoic acid and n-acetylcysteine can tackle insulin resistance and protect the liver. 1. Scrub and peel beets. Cut into wedges; place on a baking sheet coated with cooking spray. Spritz beets with additional cooking spray until coated. Bake at 350° for 40-50 minutes or until tender, turning occasionally. 2. Meanwhile, for dressing, heat orange juice over medium heat in a small saucepan. Bring to a boil. Reduce heat; simmer, uncovered until liquid is syrupy and reduced to about 1/3 cup. Remove from heat. Whisk in next seven ingredients. Set aside to cool. 3. Just before serving, place arugula in a large bowl. Drizzle with 1/4 cup dressing; toss to coat. Divide mixture among six salad plates. 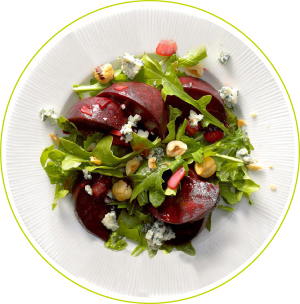 Place beets in the same bowl; add remaining dressing and toss to coat. Arrange on plates. Sprinkle salads with blue cheese and hazelnuts.